Taste test: The first thing we noticed about this snack mix was how much of it there was: The bag was densely filled with snack mix, all the way to the top. The whole 1-lb. bag cost just $1, so it was a pretty amazing value. 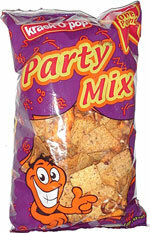 The mix itself was very good, combining several good Krack-O-Pop snacks. The triangular Nacho Tortillas have a unique taste among tortilla chips, very good, not super-cheesy, and quite different from your typical Doritos. The knot-shaped pretzels are your standard pretzels. 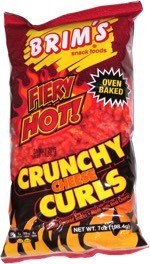 The Cheese Crunchies are quite good, with a nice crisp crunch to them and lots of cheese taste. They're fairly pale in color in comparison with the fluorescent orange color of many cheese curls. The BBQ Corn Chips are rectangular in shape and flat, with a very nice, mild barbecue taste on a chip that tastes very similar to the triangular Nacho Tortillas. Overall, a pretty good mix. Smell test: Smells like a mix of corn chips and tortilla chips. From the package: “Product of Canada” ... Ingredients are listed separately for each of the kinds of chips in the mix.